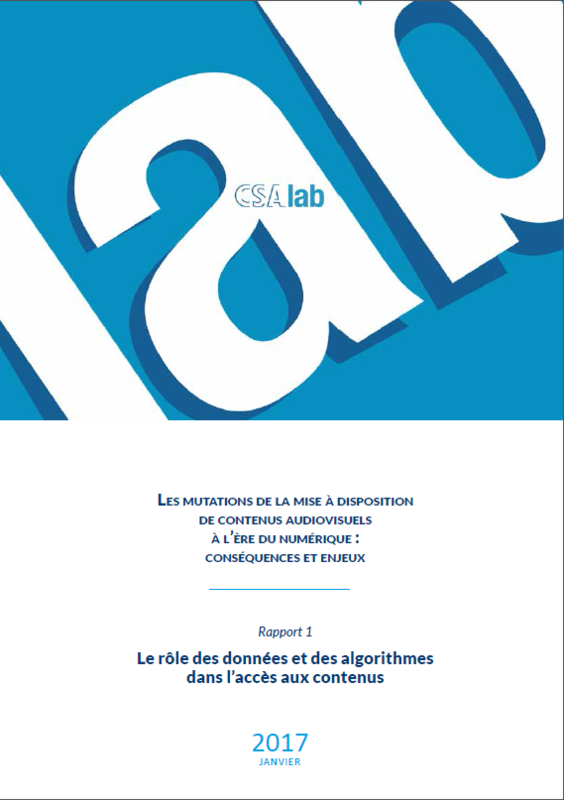 On 14 June 2016, the French CSA launched CSA Lab, a prospective think-tank, composed of seven leading experts and chaired by CSA members Nathalie Sonnac and Nicolas Curien. Its objective is to study the transition of economy and regulation caused by the digitisation of the audiovisual sector by producing regular reports. The first report delivered by the CSA Lab on 20 January 2017 focuses on the impact of data & algorithms on accessing content. The analysis emphasises that the "dataification" of the world with the development of big data also impacts the media. In the audiovisual sector, algorithms can take many different forms such as recommender systems or programmatic advertising. Their approach may be based on matching or profiling. Their influence thus requires to be assessed according to their structure or their aim. The report presents a typology of algorithms that are used in the audiovisual sector and puts them in relation with key public policy goals for a sustainable digital development, namely: cultural diversity, consumer protection and trust.